Hi everyone! Today I’ve got something extra special for you all: two posts that will be combined into one. I have two sets of gorgeous swatches that I just couldn’t wait to share, so I decided to post them both today. Enjoy! My first swatch is another bright, summery shade that will look great with just about anything. It’s Essie In the Cab-ana from the 2013 Resort Shades collection. You would not believe how incredibly difficult these polishes are to find right now. In the Cab-ana is especially popular, so getting it was tough, but I managed to find it in Target. This vibrant blue color reminds me of the sunny Caribbean beaches. It’s a perfect shade to wear if you’re pining for a little time by the sea. As always with Essie, the formula for In the Cab-ana was flawless. No balding and opaque in two coats. Pictures below show the polish with one coat of Seche Vite. You can find Essie polishes at Ulta, Walgreens, Target and other major drug/department stores. You may be able to find a Resort Colors display if you’re lucky. Let me know if you’re able to find these anywhere! Alright lucky readers, here’s the second set of swatches for the Sunday Special. I present to you Honey Rider, a Liquid Sand polish from the OPI Bond Girls collection. This polish is also perfect for summer because it reminds me of the sunshine. Honey Rider is absolutely breathtaking in sunlight. Keep reading for pictorial evidence. I did notice that Honey Rider has a bit of a thicker formula than the other Liquid Sand polishes, but that didn’t bother me. Application was smooth and I got great coverage in two coats. I did not use a top coat because I like the texture; however, you’re welcome to apply a top coat for a glossy finish. You can buy the OPI Bond Girls collection at Ulta for $9.00 each. All shades are Liquid Sand polishes. Do you plan to pick any up? I hope you all enjoy the rest of your Sunday and I’ll see you next time with some more fabulous swatches. Hello again everyone! I hope you’re all enjoying this lovely Saturday. Here in North Carolina the weather has started to get really hot and humid. I’m so not looking forward to that aspect of summer. I hate hot weather and rarely get to go to the beach so summer is my least favorite season. One thing that I do enjoy about summer is the bright color palette. Zoya recently launched its Pixie Dust summer collection. I ran across one lonely bottle of Stevie a few weeks ago at Ulta and my boyfriend bought it for me. I’ve been coveting this color since I saw it on other polish blogs. If you read my previous Pixie Dust review, then you know how much I loved Chyna. Let me tell you guys, I am in love with Stevie too. This is a beautiful light purple with tons and tons of silver glitter, which gives the perfect amount of shimmer, especially in natural light. Stevie is gorgeous. Application was smooth and simple. Textured polishes are generally very forgiving, so if you mess up a little it is very easy to fix your mistake without having to remove and start all over. I was also able to wear Stevie for five days with minimal tip wear and it did not chip. 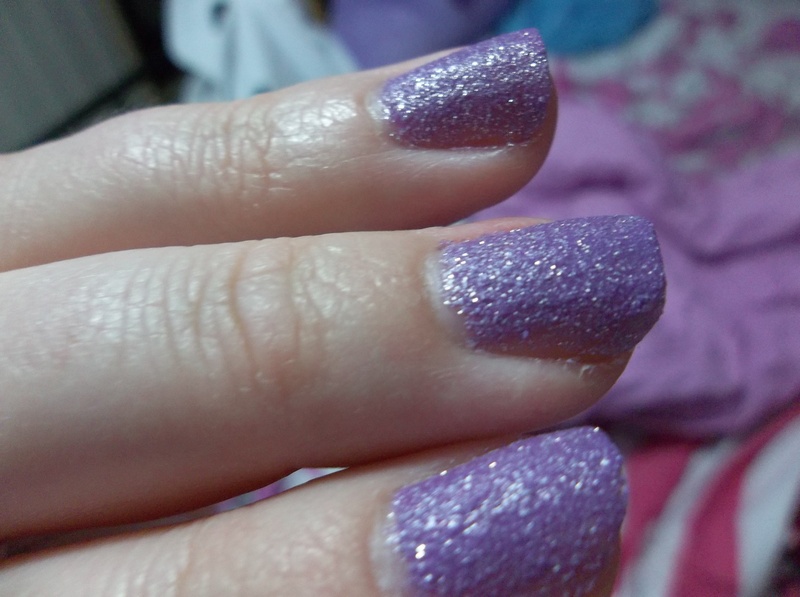 After trying two Pixie Dust polishes, I really don’t think Zoya can do any wrong. I highly recommend trying at least one Pixie Dust polish, even if you’re not completely sold on the textured trend yet. You can purchase Pixie Dust from Zoya’s website for $9.00 each. Have you tried Pixie Dust yet? Are you just as hooked as I am? Let me know in the comments! Hello everyone! Happy Tuesday! I hope you guys are having a great week so far. Does anyone have any plans next week for Memorial Day? I don’t have anything special planned, but I’m definitely glad to have a holiday off! Today I bring you something that can only be described as bizarre. I know textured polishes are “in” this season (like OPI Liquid Sand and Zoya Pixie Dust), but Sally Hansen has created a product that I just don’t understand. It’s called Fuzzy Coat. These polishes have fibers in them and when you paint them on it looks like your nails are fuzzy (think hideous fuzzy angora sweater). I’m really not sure where this idea came from, but I thought it would be fun to at least try it out. Here’s my mani for this week. It’s just three simple coats of OPI I Theodora You and one coat of Seche Vite top coat. I applied this polish on Sunday. Before I get to the Fuzzy Coat, I do have a simple request of my fellow beauty bloggers. If you guys have tried I Theodora You, could you please give me some advice on application? I absolutely love the color, but every time I try to wear it, it streaks so badly and leaves yucky bald patches. I can only wear it for a day or two before it gets on my nerves. If you have any words of wisdom, please let me know! I found application to be messy. The fibers do tend to stray on to the sides of your finger. Also, they clump and don’t distribute evenly across the nail. I didn’t really like the way this looked, so I’m going to say that fuzzy nails are a trend that I just can’t get behind. I removed the polish after wearing it long enough to photograph it for this entry. Removal was surprisingly easy, which is a plus if you’re going to be trying the product. You can purchase Sally Hansen Fuzzy Coat at Target for $5.49. So what do you guys think? Have you tried Fuzzy Coat? Will you? Let me know in the comments.